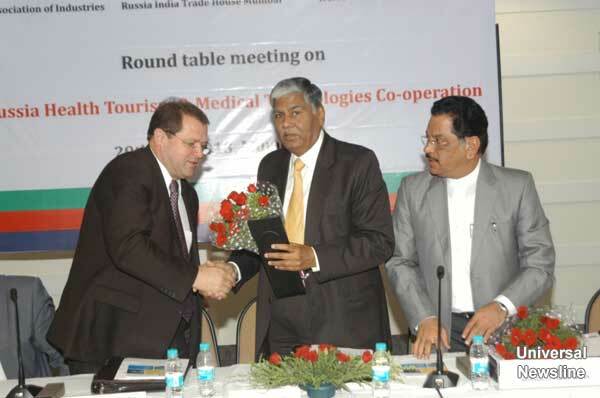 WTC Mumbai, AIAI and Russia India Trade House Mumbai organized a round table meeting on the Healthcare System in India, at the financial capital of Mumbai. Present at the meet was Mr. Suresh Shetty, Minister of Protocol and Public Health, Government of Maharashtra, who noted that the healthcare industry in India and Russia has undergone a significant change in the last 15 to 20 years with new research, updated technology and new systems. However he outlined many prominent issues like the shortage of human resources such as doctors, nurses and paramedics as well as the rising costs of medical health services in the private sector. He appealed to the private sector to join hands with the government to provide charitable services for the needy. Private hospitals should adhere to the stipulated guidelines of 20% free medical service and a contribution of 2% revenues towards medical facilities for the poor. Institutes unwilling to abide by these conditions may function as corporate hospitals sans benefits, he added. India in the recent past has been focusing on health as one of the key departments for development. Focusing on rural health, Mr. Shetty said that many initiatives such as the National Rural Health Mission work towards upgrading rural medical infrastructure. Going forward, India should adopt innovations in the health sector such as telemedicine, research in cardiology and oncology along with updated medical technologies. Alexander Lukianov, the Head of the PR Directorate of Moscow Foreign Economic and International Relations Department stated that today’s meet shall open avenues for ground level co-operation for the Indian and Russian medical fraternities. Our visit to Indian hospitals has helped us gain first hand understanding and assessment about their functioning. The Moscow government gives great importance to the co- operation between the doctors, specialists, health services and hospitals between the two countries. H.E. Alexey Novikov, Counsul General of Russian Federation in Mumbai to India was present on the occasion. He stated that the Government of Moscow and India work together on many sectors and promote bilateral trade. Today’s meet has demonstrated tremendous potential for mutual collaboration in the healthcare sector among others. Mr. Vijay Kalantri, Vice Chairman, World Trade Centre Mumbai and President of All India Association of Industries said that the India- Russia bilateral trade stands at US $ 11 Billion. The initiatives by WTC Mumbai & AIAI, such as the Russia- India Trade House Mumbai aim to cross bilateral trade worth US $ 20 Billion by 2015. As of date, healthcare is a very small portion of the India- Russia international trade. Today’s meet shall take forward business in the healthcare segment as well, enabling the two countries to move forward together. Important dignitaries such as Meeta Rajivlochan, Secretary Public Health Government of Maharashtra, Alexander Alexey, the Deputy Counsul General of Russian Federation in Mumbai and management personnel from renowned hospitals such as Jaslok Hospital, Bombay Hospital, Wockhard Hospital, Hinduja Hospital, Fortis Hospital, Saifee Hospital, Kokilaben Dhirubhai Ambani Hospital, Lilavati Hospital and the NM Medical Institute were present. Mr. Y. R. Warerkar, Executive Director, WTC Mumbai and Ms. Rupa Naik, Executive Director, AIAI felicitated the Russian delegation which is in Mumbai for a two day visit and shall be paying a visit to hospitals and Medical Institutes in the city. At the ceremony’s conclusion, Ms. Rupa Naik proposed the vote of thanks.